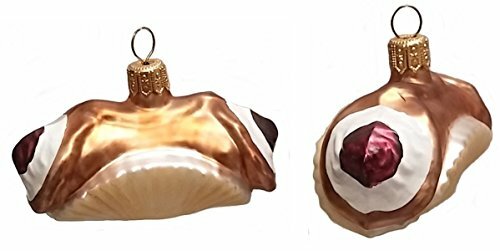 Decorate your Christmas tree with these delightful ornaments celebrating Italian food: one of the most popular cuisines in the world! "Italian food is made with love," they say...and love, too, is what the holiday season is all about! 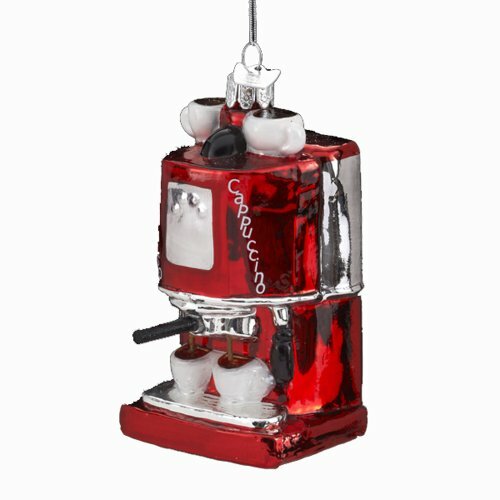 The Christmas ornaments featured on this page are a wonderful assortment of cute, clever and lovely collectible gems all featuring the ingredients and dishes typical of Italian cuisine. 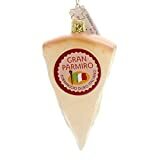 They're just perfect for an Italian family Christmas tree, whether your own or perhaps as a gift to someone you know who is passionate about Italian food. You'll never believe some of the whimsical designs these artists and manufacturers have created, and if you're like me then they'll probably get you hungry just looking at them! Pasta is, of course, one of the building blocks of Italian cuisine. The ornaments below either feature classic pasta noodle shapes or finished Italian entrees featuring pasta that we all know and love. Ah, lasagna...who doesn't love this delicious, decadent pasta entree? Here we have a beautiful glass ornament featuring a hearty slice of ricotta-and-tomato sauce lasagna...topped with fresh basil, of course! The color and beautiful detail on this ornament really stands out. And it's Christmas-colored, too! A great choice to start a collection on an Italian-food theme. Do you know someone who makes their own pasta at home? 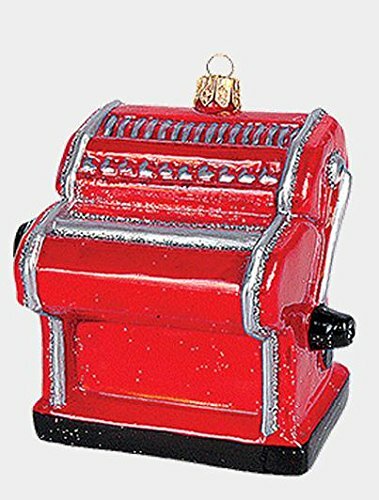 Then they're sure to be delighted by this ornament, featuring a wonderfully-detailed hand-cranked pasta machine. This is just the type you'll find in many Italian home kitchens, for making paper-thin noodles, lasagna sheets, ravioli, etc. Made of glass it will sparkle and shine. Meatballs and pasta...an Italian-American favorite combination. And don't forget the gravy! Here we have a pot of hot and tasty meatballs in sauce, a plate of ziti topped with meatballs and sauce, and of course the classic spaghetti and meatballs. Made of resin these are well-detailed but sturdy, and sure to last for many years to come. The eternal debate: Is it "Gravy" or "Sauce"? What do you call it in your household? It depends on if there is meat in it (then it's "Gravy") or not (then it's "Sauce). The Pasta Song: Can You Sing Along? 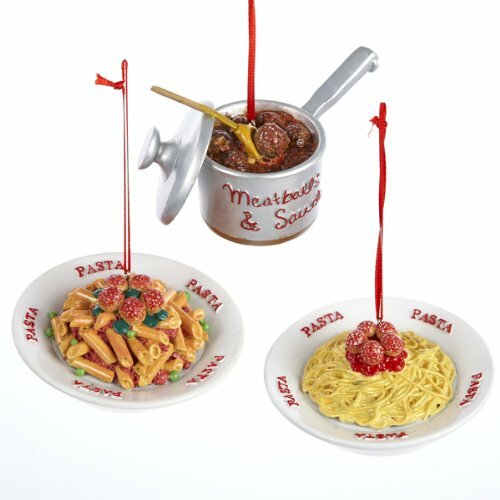 If you thought the pasta ornaments were whimsical, then get a look at this collection! It features four basic ingredients used so much in Italian cooking: olive oil, balsamic vinegar, prosciutto and salami. There are actually two of each design in this set, so you can really fill up your Christmas tree with tasty ingredients. Or, maybe keep one set of four for yourself and give the other four to someone else as a gift? The choice is yours. These are made of glass and 3.5" in size, so they will definitely make a statement and be a fun conversation piece! Prosciutto is a dry-cured ham, typical of Italian cuisine. It is not cooked or smoked like a typical ham, but salted and aged by air-drying for an extended period of time. The result is a sweet, luscious meat that is enjoyed thin-sliced on salads, antipasti platters, sandwiches or even draped on a pizza after baking. A classic Italian antipasto choice is to serve sweet slices of melon wrapped in prosciutto for a salty-sweet treat. Of course, you can't finish off an Italian meal without at least a little Parmesan cheese! It's a vital part of so many dishes: risottos, lasagna, shaved on salads, served by itself with a little balsamic vinegar. Just hold back on the cheese when eating seafood, please! 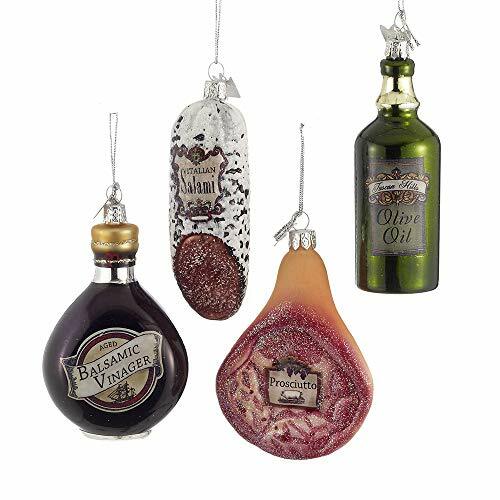 Here are several Christmas ornaments celebrating this essential element of Italian cuisine and cooking. Make your own Christmas ornaments...from pasta? 17 Homemade Christmas Decorations Made from Pasta: Gold glittered bowties, pasta angels, macaroni stars, even entire mini-trees made out of pasta shells! There are some great ideas to explore here. How to Make Gorgeous Christmas Ornaments from Pasta: More great ideas here, from pasta snowflakes and flowers to wreaths and even a pasta race car! DIY Pasta Ornaments: Here's a super-simple project that's perfect for young children. Easy DIY Pasta Christmas Ornaments: Another very simple project to make pasta candy canes and weaths. Making a Colored Pasta Garland: Pasta can be great for stringing together to make a tree garland, too! How about an entire pasta Christmas tree? Then why not go with one of these glass pasta box ornaments instead? 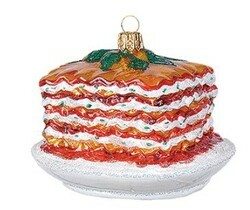 If one cannoli isn't enough for you, why not get this pair of glass ornaments from Poland? Colorful and shiny, these also come in a nice box for easy gift-giving. 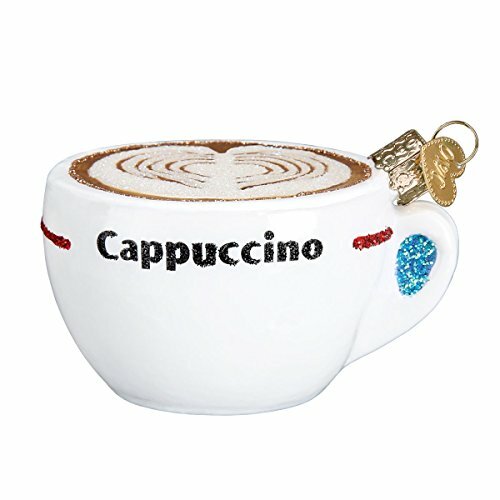 Lastly, Don't Forget the Espresso and Cappuccino! Are You Ready for a Very Italian Christmas Now? Well, you can order it any time of day (in Italy) but it's a sure sign that you're a foreigner if you do so outside of breakfast hours. Italians consider it a morning beverage. Yum. I didn't know cappuccino was served only at breakfast. Your articles on Italy are wonderful. The Feast of the Seven Fishes is a traditional Italian American meal served on Christmas Eve. Learn more about the meal and how you could prepare it at home for your own family.